Twentieth Century: Shostakovich, Prokofiev, Stravinsky, Copland, Bartok. Ancient stories told in the Orient (Egypt, Persia, India) by word of mouth. Specific sources unknown. Revived in the 18th century and introduced to fascinated European readers. Particularly influential was a French adaptation by Antoine Galland, entitled Les milles et une nuits (1001 nights), serialized beginning in 1704 with the adventures of Sinbad the sailor. Orientalism (Chinoiserie, Turquerie), swept the European continent during this time and into the 19th century, influencing Rimsky-Korsakov to compose Scheherazade. Peter the Great (1682-1725) builds St. Petersburg, 1703. Mikhail Glinka (1804-1857) opera, A Life For The Czar, 1836. Mily Balakirev (1837-1910): Army engineer. César Cui (1835-1918): Military engineer. Modest Mussorgsky (1839-1881): Army, civil servant. Nicolai Rimsky-Korsakov (1844-1908): Aristocrat, Naval officer. Rubinstein brothers start the St. Petersburg (1862) and Moscow (1864) Conservatories. Rimsky-Korsakov, the only member of The Five to become professor in a Conservatory. Led by Balakirev, they collaborated 1856-1870. They were all young (age range 18-28) and musical amateurs. All except Rimsky-Korsakov remained amateurs. They attempted to create a Russian nationalist music that drew mainly from folk sources. They deliberately rejected Germanic musical procedures as polyphony, complex counterpoint and developmental music. While rhythmically and expressively powerful, their music is essentially thematic and sounds “unrefined” to ears accustomed to German/Italian music. Orientalism, the use of Eastern themes and harmonies, features prominently in their music. Scheherazade is a principle example. Born to an aristocratic family and trained as a naval officer. Took music lessons on the side. In 1862 sailed with the Russian navy as a midshipman on the clipper Almaz for 2.5 years, visiting exotic lands. Finished his First Symphony during this cruise. Premiered by Balakirev, 1865. Collaborated with “The Five” from 1865 onwards. Despite his lack of formal training, was appointed professor at the St. Petersburg Conservatory, 1871, where he taught himself harmony, counterpoint and orchestration. Inspector of Naval musical bands, 1873-1884. The post encouraged him to learn about musical instruments and orchestration. He eventually became a master at this. Scheherazade, composed in 1888. Premiered in 1889 in St. Petersburg. The trio of Scheherazade, Capriccio Espagnol and Russian Easter Overture, Rimsky’s most popular orchestral works, were composed for the Russian Symphony Concert series. The score calls it Suite Symphonique. It is actually a Tone Poem, formless music in four movements that loosely resembles a symphony. PROGRAM MUSIC: Rimsky-Korsakov initially provided a program (see below) that he later withdrew in subsequent editions. SUGGESTED INTERPRETATION: The music does NOT literally represent the stories implied by the movement labels. It merely expresses “different moods,,,images, actions and pictures” (Rimsky) inherent in the stories. LEITMOTIFS: While there are certain themes in each movement attributable to individual story elements, the only theme that sustains leitmotif status is that of Scheherazade. It appears in all four movements. PROGRAM: As it appears in the score. The Sultan Schahriar, convinced of the perfidy and faithlessness of women, vowed to execute each of his wives after the first night. But the Sultana Scheherazade saved her own life by interesting him in the tales she told him through 1001 nights. Impelled by curiosity, the Sultan put off her execution, and at last entirely abandoned his sanguinary resolve. Many marvels did Scheherazade relate to him, citing the verses of poets and the words of songs, weaving tale into tale, story into the story. The sea and Sinbad’s ship. The story of the prince-kalandar. III. The young prince and princess. Festival in Baghdad. The sea. The ship breaks up against a cliff surmounted by a bronze horseman. Conclusion. I: Largo e maestoso – Lento – Allegro non troppo – Tranquilo: E minor – E major. Formless. Resembles symphonic first movement. II: Lento – Andantino – Allegro molto – Vivace scherzando – Moderato assai – Allegro molto ed animato: B minor. ABA-Coda. Resembles scherzo. III: Andantino quasi allegretto – Pocchisimo più mosso – Come prima – Pochissimo più animato: G major. Slow movement. ABA form. IV: Allegro molto – Lento – Vivo – Allegro non troppo e maestoso – Tempo come I: E minor – E major. Formless. Episodic, sectional. THE STORY: Set in the era of the Haroun-al-Rashid, Caliph of Baghdad (the golden age of the Islamic Civilization), Sinbad The Sailor features various stories of fantastic seafaring adventures where Sinbad – sometimes more than one character – is often shipwrecked in far-away lands and encounters menacing creatures; many treasures are gained and lost. The movement opens with a menacing melody, signifying the ferocious Sultan, on trombone and tuba, with strings and winds in accompaniment. NOTE: This will be the main source of others themes in the work. Transitional music: A solemn chorale in winds, introduces Scheherazade. NOTE: This chorale, heard near the beginning of the work, will return in Movement IV, just before the finale. Solo violin plays a sinuous, seductive theme, a soaring melody with harp arpeggios in accompaniment that add a heavenly touch to the character. Cadenza: Theme ends with a soaring cadenza, also on solo violin. Sinbad, Rough Sea/Calm Sea: From here on, the movement features three sets of variations, each comprised of a Rough Sea/Calm Sea pair. Sinbad Theme: In cellos. The tune closely resembles the Schahriar Theme. It is an open ended, antecedent phrase without a consequent. Its varied repetitions create an impression of a persistent quest. Rolling Ship Theme: Sinbad is always accompanied by a quiet, rising falling tune in strings that represents the rolling of his ship in the waves. Rough Sea: The music is loud and turbulent. Sinbad is in rough seas. Sinbad Theme presented in triple variation: a – a’ – a’’. a’’ longer and more elaborate, reaches a climax. a – a’ – a’’ repeated in slight variation into another climax. First Calm Sea: Music calms down. Themes heard so far are developed. Tranquil oboe/clarinet chorale, echoed in flute. Cellos begin the Rolling Ship Theme. The bare tune is heard more easily. Atop the Rolling Ship, a placid conversation occurs – based on Sinbad motives – between solo horn and solo wind instruments, flute, oboe and clarinet respectively. A sweet tune on solo violin – based on Scheherazade Theme – with echoes on clarinet, with Rolling Ship accompaniment in pizz strings. This brief appearance of Scheherazade is a reminder that she is the story teller. Second Rough Sea: Turbulent, developmental music. In two sections. Storm Theme: Derived from Scheherazade, this is a loud, blustery melody, evoking an image of high wind. Section I is a stormy passage in strings and winds, featuring Storm in counterpoint with Sinbad motives. Sinbad Theme, loud on trombone and tuba, amid the raging storm. Loud string variation reaches a huge climax that ends section I. In Section II, the a – a’ – a’’ Sinbad sequence appears in a new set of variations, with the storm still raging. The a and a’ phrases feature Sinbad, loud and turbulent on strings. Each phrase ends with a motive of the Storm Theme and two emphatic chords. The a’’ phrase, long and elaborate, features Sinbad on horns and trumpets in counterpoint with Storm, in the loudest and most turbulent passage yet. Second Calm Sea: The two sections of the first Calm Sea repeated in variation. Section I: Calm music derived from Rolling Ship theme in strings. Cello converses with a sequence of solo wind instruments, clarinet, oboe and flute, respectively. Each phrase – based on Sinbad – in a different key. Rolling ship theme remains in quiet pizz. accompaniment. Section II: Scheherazade variation on solo violin with flute echoes. Third Rough Sea: Back to loud, turbulent music. Storm Theme in counterpoint with Sinbad motive on ff brass. Two ff Sinbad Themes on trombone amid the raging storm. Sinbad a’’ phrase loud on trumpets, climaxes, its rising antecedent phrase repeated emphatically four times. NOTE: This is a moment of maximum dramatic tension in the movement. Third Calm Sea: Music Calms down and the tension resolves. Sinbad Theme dolce on flute, then oboe, in beautiful, lyrical passages that sharply contrast with the turmoil that just ended, with Rolling Ship in pizz. accompaniment. Clarinet responds with a placid, three note consequent to Sinbad’s antecedent. Tension melts away. Sinbad has finally found refuge. The new Sinbad, with its antecedent and consequent repeated twice by strings in tranquil passages that confirm the resolution of tension. Codetta derived from the Rolling Ship Theme, comes to a calm end, the ship still rolling. Three calm cadence chords, held over pizzicato string beats, (a plagal cadence) brings the movement to a peaceful conclusion. Movement I vaguely resembles Sonata Form. In the beginning themes are stated, in the middle they are subjected to variation, the main theme (Sinbad) returning in the end. Unlike Sonata Form, the central tension of the movement is not harmonic but rather melodic: Sinbad is an incomplete antecedent until the very end, where it receives a simple, placid consequent that dramatically resolves the tension. Rimsky-Korsakov displays craftsmanship in his developmental passages, complex counterpoint and Beethovenian thematic unity, all uncharacteristic of The Five. The main charm of the movement, its “easy listening” style, lies in Rimsky’s masterful orchestration, never quite the same, keeping the repetitive variations fresh. Three main themes (Schahriar, Scheherazade, Sinbad). Sinbad variations come in phase groupings of three, a – a’ – a’’. Overall structure of the movement is three Rough Sea/Calm Sea pairs. Kalandars (also spelled Kalender or Calender) were beggars who wandered from town to town dressed in rags. They were feted by royalty for superstitious reasons. Three Kalandars have a chance meeting in Baghdad on their way to the court of Caliph Haroun-al-Rashid. They have two things in common: they each used to be royal princes and they each have lost an eye. They tell each other their stories of misfortune, of how they came to be this way. These are convoluted, fantastic stories involving multiple adversities with menacing characters such as evil viziers with enemy armies, ambushing bandits, and malicious genies. Prior to losing their eyes and escaping as beggars, they are imprisoned, trapped underground, enslaved, bewitched, one of them temporarily converted to a monkey. Solo violin states the Scheherazade Theme with harp arpeggios in accompaniment. Soaring cadenza more expressive than in Movement I, with double stops. The Kalandar Theme – derived from Schahriar – is another exotic melody with two main phrases, a and b. The phrase structure is a – a’ – b – b’ – b’’. 1) Kalandar on bassoon with a soft pedal accompaniment in strings. 2) Kalandar on oboe with harp arpeggios. 3) Kalandar, louder, waltz-like, in violas with pizz string accompaniment. The b phrases louder and more emphatic, climaxing on b’’. NOTE: This loud and emphatic presentation of b foreshadows the da capo. Kalandar, truncated (phrases a – a’’), in winds with tympani rolls. In a sublime passage, solo cello poses a question (b phrase), echoed by bassoon. Oboe responds (a phrase), dolce. Cello melody repeated in slight variation, this time horn responds. Solo oboe concludes peacefully with a sinuous melody (variation of b’’), with harp flourishes. NOTE: This codetta foreshadows the end of the movement. The Coda will feature the same music, but with different orchestration and mood. It will not end peacefully. This section features calm, sweet, exotic music, signifying the young princes in their innocent, royal days before they were overcome by adversity. Variations on the theme are achieved solely through changes in orchestration. An ominous gesture erupts on low strings, followed by violin tremolos. The gesture is derived from the last five notes of the Scheherazade. Loud fanfare on trombone over continued violin tremolos, harkens danger. This fanfare – derived from Schahriar – will be the main theme of the B section. Music quiets in anticipation. A distant trumpet sounds another fanfare. Another ominous gesture in low strings, this time the Schahriar Theme is more recognizable. String tremolos and loud horn fanfare follow. Evil adversary? Another quiet section with a distant horn fanfare. Loud March: A more elaborate series of brass fanfares over string tremolos, increase in tempo and climax with a cymbal crash. Music suggests a struggle or a battle. Music calms. Solo clarinet states an extended variation of Kalandar (phrase b) over pizz strings. The music is pleading/imploring. The Prince in trouble? Extended March Variations: A cymbal clash. Fanfares return in trumpet and winds, and lead to a mousy march. Prince trying to escape? March picks up energy; repeated fanfares in brass and winds. March in low strings, alternating with winds, still energetic. Quieter march in winds with cymbal clashes. Louder march in trombones alternating with winds. Climaxes. March in winds with full orchestral accompaniment, loud and fast. Climaxes with loud fanfare motives on brass. Sinuous bassoon solo on Kalandar Theme (phrase b) over pizz strings, echoed by winds, piccolo included. The piccolo adds a high register to the echoes, giving the music an imploring feel, like a cry for help. The Prince imprisoned, turned into a monkey, looking for help? Bassoon/wind conversation repeated three times. Transitional music in various wind instruments leads to return of A. The B section is in dramatic contrast with the calm and sweet A. While the section does not reflect any specific tale from the three Kalandar stories, it clearly projects a sense of struggle or battle ensnaring the Kalandar prince, a central feature of these stories. Three variations on a louder, more emphatic Kalandar Theme. 1) The full theme returns loud, in winds and violins. The b – b’ –b’’ phrases soar in winds and brass. 2) The full theme in strings. Its last phrase (b’’), more elaborate, vigorously rises to a climax. 3) Truncated theme (a & a’ phrases only), in strings with brass wind and percussion emphasis, climaxes three times. The Kalandar Theme is no longer sweet and lyrical as in the beginning. It is loud, dramatic and forceful. The prince has been altered by what happened in B. Music abruptly calms and assumes a celestial feel. Muted strings state Kalandar (b phrase) in a quiet passage over string tremolos and harp arpeggios and a dramatic harp glissade. Solo flute states Kalandar (a & a’ phrases) in a sweet, lyrical passage with harp arpeggios. The conversation repeated in solo horn and solo viola. String tremolos maintain a celestial mood. Music rushes to a loud and dramatic conclusion, with an accelerando, crescendo passage based on the soaring b’’ phrase of Kalandar, with Sinbad rising in the bass. Concluding chords, ff with blaring brass and drumrolls, end in an open cadence. The music of the coda is the same as that of Section A Codetta. Rimsky’s new orchestration of the horn/string conversations gives it an out-of-this world feel. The celestial quality of this music is a reminder that Prince Kalandar is, after all, a fantasy story. The final open cadence suggests an “ever after” ending, implying perhaps, that the stories will go on. There are numerous princes & princesses in 1001 Arabian Nights. The music does not reference any particular story. Theme: The Prince Theme is a slow, lyrical tune in violins. Phrases: a – b – a’ – b’ – c.
Derived from Schahriar, more ornamented and rhythmically altered. Codetta: Exotic, rising-falling scales in clarinet. This will regularly recur in association with the Prince Theme. Variation I: In cellos, with codetta (rising-falling scales) in flute. Variation II: Theme motive contrasted against codetta scales, with occasional woodwind flourishes. The passage sounds developmental and ends in an open cadence. Theme: The Princess Theme is a playful, dance-like tune on clarinet, in 6/8 time, to be played grazioso (gracefully) according to the score. It is accompanied by a snare drum that gives the theme a somewhat regal feel. This theme will regularly be accompanied with percussion in its appearances. The Prince and Princess themes are closely related to each other. Variation I: Princess Theme repeated in clarinet and bassoon with accents on triangle. Variation II: Muted violins (a lyrical, espressivo passage) converse with winds accented by percussion. Two loud Princess Theme motives soar in the strings. Variation III: On piccolo with wind accompaniment and accents on percussion. Strings answer back in a lyrical passage. Piccolo and wind version repeated. Two Princess motives soar loudly on trumpets, each climaxing with loud percussion accents and a cymbal crash. Ends in an open cadence. Prince: A truncated Prince Theme, first on violins (dolce e cantabile), then celli with a single flourish of codetta scales in violins. Concludes with a gorgeous oboe passage based on the theme, sinuous and exotic, marked a piacere (tempo & dynamics up to the performer). Scheherazade: Familiar tune returns in solo violin with harp arpeggios, with a longer, more virtuosic cadenza. Prince, Variation I: The violin continues with cadenza music, while Prince motive (a phrase) appears on oboe, then clarinet. Solo violin soars with the last phrase of the Prince Theme. The passage is marked con forza (forcefully) in the score. A massive orchestral swell on the same phrase, with tympani rolls and a loud cymbal crash in the beginning, harp glissade in the end. Very dramatic. NOTE: This passage signifies love or unison between the Prince and Princess. Rising-falling Codetta scales in flute and clarinet, alternate with solo violin cadenza figurations. New Codetta: Price Theme motive (phrase a) in solo horn. Strings, winds and solo horn echo the end of the phrase. Open cadence with slow drumbeats and pause. Princess: Strings play a lyrical variation of the Princess Theme, its main motive rising in a loud passage. No percussion accompaniment. Princess Variation: Another variation of Princess in strings, this time the music slows and falls. NOTE: This section, with its rising-falling music, was described by Rimsky as denoting the Princess being carried in a palanquin. Prince: Three variations on a Prince motive (phrase c) in strings, echoed by solo flute. Movement ends quietly with Princess motives in flute, oboe and bassoon, scherzando (playfully), with her trademark percussion accompaniment. MOVEMENT IV: FESTIVAL IN BAGHDAD. THE SEA. THE SHIP BREAKS UP AGAINST A CLIFF SURMOUNTED BY A BRONZE HORSEMAN. CONCLUSION. Sultan Schahriar: Brief and menacing, the Schahriar Theme begins the movement. Scheherazade: Solo violin plays the Scheherazade theme as a cadenza in its entirety. In contrast to earlier sweet and heavenly versions, this Scheherazade, with a continuous soft pedal on low strings and violin playing double stops has a troubled feel. The soaring melody at the end, previously the only cadenza, is ushered in with a single harp arpeggio. Unlike earlier versions it is not virtuosic, but a brief, simple legato line. Schahriar: In a passage marked Allegro molto e frenetico (very fast and frantic), Schahriar returns loud, in full orchestra, lengthier and more menacing, with bellicose percussion beats. Scheherazade: Solo violin repeats the Scheherazade theme as another full cadenza. The passage is marked con forza (forcefully). It lacks the soaring melody at the end. With a soft pedal accompaniment in low strings and violin playing triple stops, the music sounds even more troubled. This introduction is a reminder that the story is about to end and Scheherazade is facing execution, ordered by Schahriar, reflected in troubled versions of her theme pitted against fierce versions of the Sultan. She must sustain her storytelling at a new level to save her life. Unlike earlier movements, the fourth will feature multiple subjects instead of a single one. In this section, Rimsky delivers a veritable kaleidoscope of sounds that evoke the lively chaos of an ancient Middle Eastern capital amid a festival. Rimsky begins with a new theme that denotes the festival, but then liberally recalls music from earlier movements that appear and disappear at a dizzying pace. The following is a description of what transpires. I recommend that the listener not focus on the thematic derivations but simply appreciate the section for the diverse, bustling, exotic mood it conveys. I: Starts with loud cymbal crash. Theme in flute with a soft but energetic string accompaniment. II: Louder, in strings, with horn and bassoon in accompaniment. III: Yet louder, in strings and winds, with accents on percussion. Fast momentum of the festival continues uninterrupted with brass fanfares from the B section of the Kalandar movement, loud, with drumbeats and cymbal clashes. Loud and boisterous version of the Kalandar Theme from the A section of Movement II (b phrase), first heroic on horns and winds, then mousy and ridiculous on piccolo. Longer, more insistent Kalandar (b phrase) on horns and winds. Loud, dramatic music, Kalandar motive (phrase b’’) with drumbeats and brass fanfares. Concludes in a spiraling fall and open cadence. From Movement III, in flute with familiar tambourine accompaniment. Princess Theme repeated loud in strings and winds with harp arpeggios. Violins use spiccato bowing – a light, bouncing bowing technique – in a fast, lively passage (assai) with offbeat accents in winds and pizz strings. The music sounds like the buzzing of a bee. Repeated in clarinet, still bee-like, with offbeat accents in strings, winds and percussion. Loud and dramatic Kalandar brass fanfares (from the B section of Movement II), dramatically accented with cymbal crashes, alternate three times with Kalandar motive (phrase b) in winds. NOTE: This music does not have the same ominous connotation as in the Kalandar movement. It is a fast and energetic continuation of the festival. The section is repeated, louder, with more percussion. Repeated twice with fanfares in trombone and tuba. Shahriar leads to a dramatic crescendo on Festival Theme motive in winds, the piccolo distinctive with its melody. It rises to a loud climax with drumbeats in multiple percussion instruments. Quieter passage with festival theme motives in winds pitted against new fanfare motives in low strings. Kalandar B section fanfares in distant trumpets. Festival Theme in winds, a quiet but energetic passage. Theme repeated loud in winds and strings, with dramatic percussion emphasis, in a passage that becomes stormy, persistently restating theme motive. Music remains loud and maintains momentum with loud brass fanfares from the B section of Kalandar Movement. Percussion beats redolent of a swordfight. Music suddenly quiets to a short, rapid passage in winds on Kalandar A section motive (phrase b). Full orchestra picks up the tune, repeating it loud in a dramatic accelerando passage with drumbeats. Fiery, loud version of the Kalandar (phrase b’’) with lightning-like accents in horns and percussion. Music spirals down in a transitional passage. The Princess Theme in oboe with its familiar percussion accompaniment. Variation of the theme, lyrical and loud in violins. Fast, busy tune in strings with staccato wind accents. In piccolo with percussion accents. Open cadence and dramatic pause. The section features an array of contrasting melodies juxtaposed against each other, many in passages that sound developmental. The intent of the section is to create a potpourri of dramatically interposed music to convey a sense of animated chaos as might exist in an ancient Middle Eastern capital amid a festival. Themes from earlier movements make repeated appearances: Kalandar, Princess and Schahriar. This does not necessarily mean that the characters and events depicted in those movements are present in the Baghdad Festival. From here, the music will move on to a major recollection of Sinbad who, so far has not appeared in the movement. In a dramatic accelerando passage the Festival Theme enters a fierce storm, with an orchestral accompaniment full of lightning strikes and thunder. The storm gets louder and intensifies. Loud brass fanfares from the Kalandar movement join the blustery cacophony of the storm. The storm continues with the loudest variation of the Festival Theme, fast, accented with furious percussion beats. Climaxes in a sustained ff open cadence on brass. Sinbad Theme, loud and dramatic, stated twice on ff brass, with the storm still raging. The theme extended on brass in a lengthy passage, loud and still stormy. NOTE: There is no Rolling Ship Theme in accompaniment (as in Movement I). This is no ordinary storm. Sinbad’s ship is amid a catastrophe. After two loud brass statements of Sinbad with dramatic percussion accompaniment, the music spirals down to a brief calm. Ominous tremolos in low strings, as music anticipates what’s to come. Loud Kalandar horn fanfares (represent the Bronze Horseman) rise to a terrifying climax. Shipwreck! Music calms down to soft tremolos in low strings. The storm has finally passed. Music derived from the Coda of Movement I recalls Sinbad quietly in strings. This is followed by the first appearance of the Rolling Ship Theme. Scheherazade on solo violin, back to the sweet version with harp arpeggios. Scheherazade’s cadenza soars higher than earlier versions, the violin holding a high E.
A calm and slow Schahriar appears in cellos, while violin continues with its high note. The Sultan is no longer fearsome or menacing. Schahriar continues on, with violin holding its high note, in a beautiful passage that conveys a sense of union and harmony between husband and wife. The woodwind chorale from the beginning of Movement I reappears, with solo violin still holding its high note. A harp arpeggio ushers the last phrase of the Scheherazade theme on solo violin. Another harp arpeggio, and Scheherazade plays a final soaring cadenza, solemnly accompanied by a pedal in winds and pizz. touches in strings. Solo violin holds its high note one last time. Music fades away. The last marking in the score is a fermata (pause). The conductor is to hold still for a moment and allow the audience to savor finale before accepting applause. Rimsky’s contrasting depiction of the husband and wife in the beginning versus the end of the movement, with numerous scenes in between, many of which recall earlier themes, neatly sums up the overall composition. The menacing variations on Schahriar and troubled variations on Scheherazade in the beginning are suitable set-ups, dramatically enhancing the sweetness of the sublime, happy ending when the two reappear in unison, Schahriar tamed. “As a musician, I was then a young dilettante.” Rimsky-Korsakov in the 1880s, referring to his mid-teens. In 1861 Rimsky (age 17) met Mily Balakirev (age 24), already a well regarded composer in St. Petersburg. Balakirev became a mentor and encouraged Rimsky to compose a symphony. He premiered Rimsky’s 1st in 1865. Balakirev imposed his musical tastes and judgements on his disciples with a dictatorial approach. He disdained systematic, academic study of music, placing more emphasis on inspiration and originality rather than technique. In 1871, when he accepted a post in the St. Petersburg conservatory as professor of practical composition and instrumentation and director of the orchestra, Rimsky was woefully unprepared. At first he was barely able to keep one step ahead of his pupils. In the next few years he immersed himself in the study of harmony, counterpoint, form, and instrumentation. His Symphony #3 (1873), an exercise in all he had recently acquired – especially in counterpoint – was considered dry and pedantic by his colleagues. At this time Tchaikovsky wrote about Korsakov, noting that Rimsky was the only one of The Five who realized that the aesthetic preached by Balakirev was born out of ignorance and that Rimsky had now thrown himself into academic technique with much zeal. In the spring of 1873, Rimsky-Korsakov was offered the newly-established post of Inspector of Music Bands of the Navy Department. The appointment awoke in him a long-standing desire to learn about the construction and technique of musical instruments. He set about trying to learn to play as many instruments as possible. Rimsky-Korsakov’s growing experience as an orchestral conductor also proved to be of value to his musical development. It broadened his musical horizons beyond the limited repertoire allowed by Balakirev, into Classical and pre-Classical composers. Realizing that his musical output in this period was pedantic, Rimsky was able to move beyond and, beginning in the late 1870s and 1880s, compose material with greater motivic coherence, smoother modulations, and polished orchestration. 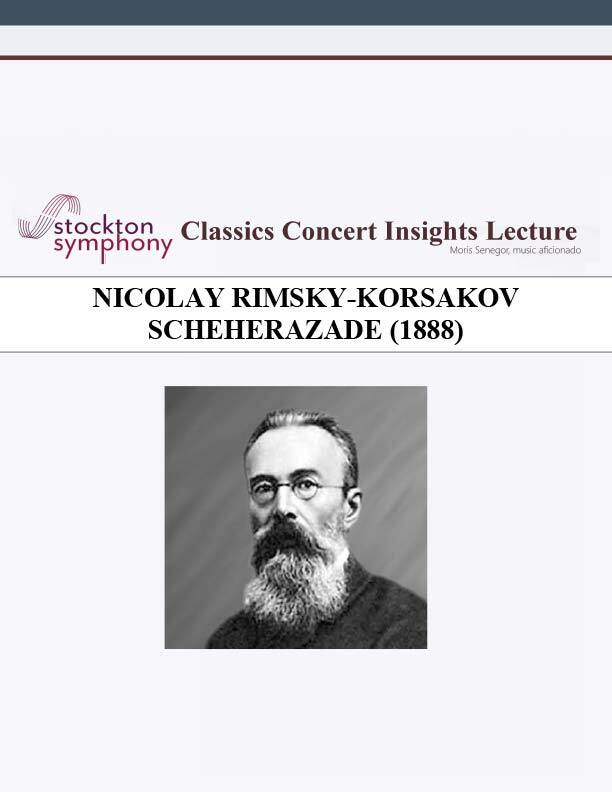 It is this mature Rimsky-Korsakov that we encounter with Scheherazade (1888).